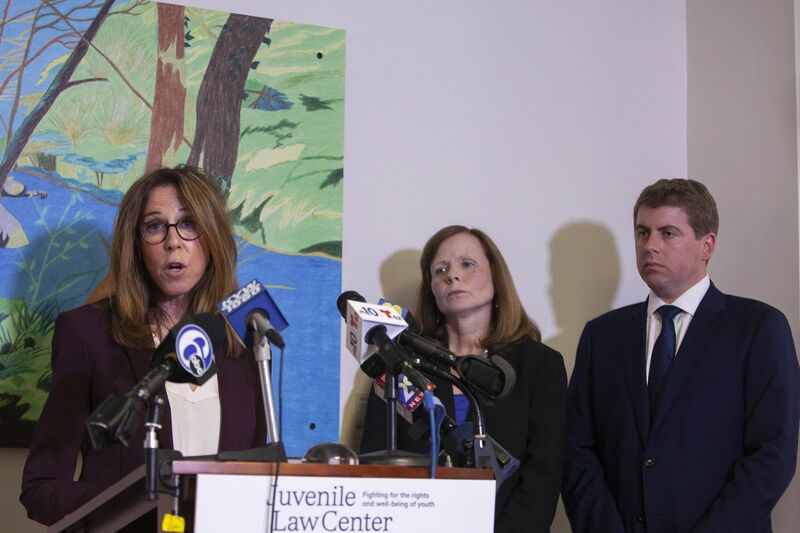 Marsha Levick (left), Chief Legal Officer of the Juvenile Law Center, speaks during a news conference, along with Maura McInerney (center) and Michael McGinley, regarding a lawsuit against Glen Mills Schools and Pa. officials, last week. Earlier this year, Inquirer reporter Lisa Gartner exposed a culture of violence and cover-ups at Glen Mills Schools, the oldest U.S. reform school for boys located in Delaware County. Nothing could’ve prepared me for the sickening and enraging details — including students enduring physical abuse and beatings — that I read in her investigation. It’s at moments like this that I wish my father, Muhammad Ali, was still here — particularly when I see the way athletic success was used to shield the school from critique or adequate oversight. The size of my father’s heart and the gravity of his words could often evoke almost immediate change. I know that he would not, as a world-class athlete and a supporter of second chances, have stood by silently while abuse of children happened in the name of sports and athletic prowess. Inspired by my father’s example, I write today in support of the lawsuit filed against Glen Mills and state officials responsible for youth in state care. The suit, filed Thursday by Juvenile Law Center, Education Law Center, and Dechert LLP, seeks financial damages on behalf of the students sent to Glen Mills by the courts only to be abused. The suit also charges that students at Glen Mills were deprived of an education. Being a mother and a black woman, I read the news about Glen Mills through a particular lens. Glen Mills was predominantly populated by black males. The young men at Glen Mills are young men like my own son. Many of the students involved in this tragedy were members of a high-risk population, more likely to endure abuse and less likely to be heard and considered newsworthy. Over the years, I’ve visited Glen Mills on numerous occasions for sporting events, including track meets and coaching sessions for my son. My motherly intuition suspected that something was not right based on the look in some of the boys’ eyes whenever I was there, as well as their response to a warm glance or gesture. But I never would’ve dreamed young men were being thrown through doors or mercilessly beaten, or that their parents were afraid to speak for fear that their children would funneled into the prison pipeline. Sadly, what happened at Glen Mills is one of many incidents that sheds light on a growing national crisis in America at the intersection of race and poverty: the lack of a level playing field. I support the work that Juvenile Law Center and Education Law Center are doing to ensure our children’s rights, especially those students who suffered at Glen Mills. Khaliah Ali Wertheimer is a clothing designer who resides in the Philadelphia suburbs with her husband and son.